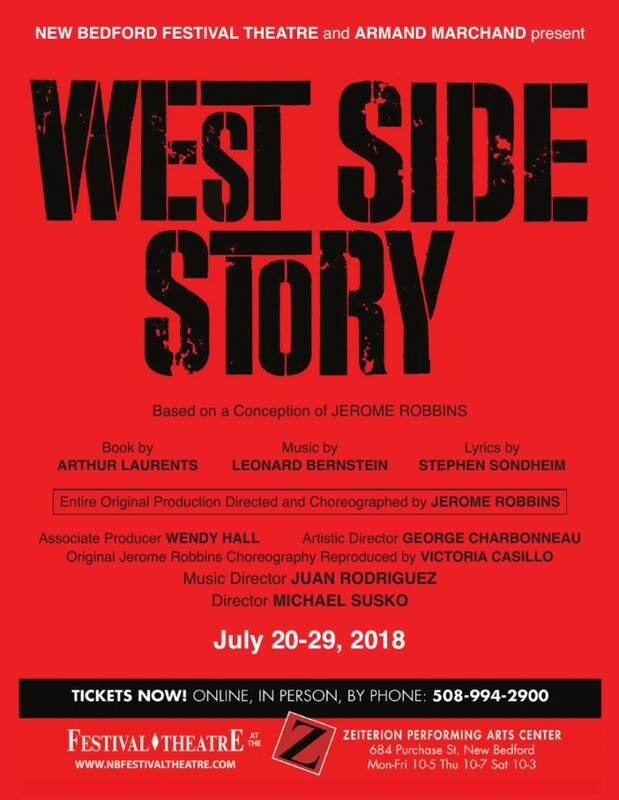 Shakespeare’s Romeo and Juliet is transported to modern-day New York City in the breathtaking musical, WEST SIDE STORY which is being presented by the New Bedford Festival Theatre July 20-29, 2018 at the Zeiterion Performing Arts Center, New Bedford, MA for 7 performances. With book by Arthur Laurents, music by Leonard Bernstein, and lyrics by Stephen Sondheim, the original 1957 Broadway production ran for over 700 performances before going on tour, and garnered 6 Tony nominations. It became the most powerful, moving, daring, and influential musical of the 1950s. Some of the musical’s legendary songs include: “Maria” “Tonight” “America” “I Feel Pretty” ”Somewhere” and “Gee. Officer Krupke.” WEST SIDE STORY will also offer audiences some of the most energetic and demanding choreography ever seen on the Zeiterion stage with “The Prologue” “The Dance at the Gym” “The Rumble” and the moving “Somewhere Ballet.” Hailed as “Electrifying” (NY Times), “A milestone in musical-drama history”(Time), and “Extraordinarily exciting”(New York Daily News), WEST SIDE STORY continues New Bedford Festival Theatre’s mission of bringing the Best of Broadway to southern New England, as it has done for the past 28 years. Tickets are on sale ($59 $52 $45 $39) at the Zeiterion Box Office, by calling 508.994.2900, or on-line at zeiterion.org.